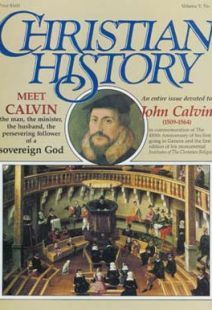 Calvin did not seek out the leadership role in Geneva; indeed, it appears he would have much preferred to avoid it. The first selection below is taken from his preface to the commentary on the Psalms. The second selection refers to his return to Geneva for the second period and is found in a letter to Farel. Whenever I call to mind the wretchedness of my life there, how can it not be but that my very soul must shudder at any proposal for my return? I will not mention the anxiety by which we were continually tossed up and down and driven to and fro from the time I was appointed your colleague. . . . When I remember by what torture my conscience was racked at that time, and with how much anxiety it was continually boiling over, forgive me if I dread the place as having about it something of a fatality in my case. You yourself, with God, are my best witness that no lesser tie could have held me there so long, save that I dared not throw off the yoke of my calling, which I was convinced had been laid on me by the Lord. Therefore, so long as I was bound hand and foot, I preferred to suffer to that extreme rather than for a moment to listen to the thoughts that were apt to come into my mind of moving elsewhere, thoughts which often stole in upon me unawares. But now that by the favour of God I am delivered, who will not excuse me if I am unwilling to plunge again into the gulf and whirlpool which I know to be so dangerous and destructive? Wherever else I had gone, I had taken care to conceal that I was the author of [the Institutes]; and I had resolved to continue in the same privacy and obscurity, until at length Guillaume Farel detained me at Geneva, not so much by counsel and exhortation, as by a dreadful curse, which I felt to be as if God had from heaven laid his mighty hand upon me to arrest me. As the most direct road to Strasbourg, to which I then intended to return, was shut up by the wars, I had resolved to pass quickly by Geneva, without staying longer than a single night in that city. A little before this, popery had been driven from it by the exertions of the excellent man whom I have named and Pierre Viret; but matters were not yet brought to a settled state, and the city was divided into ungodly and dangerous factions. Then a person who has now basely apostatized and returned to the papists, discovered me and made me known to others. Upon this, Farel, who burned with an extraordinary zeal to advance the gospel, immediately strained every nerve to detain me. And after learning that my heart was set upon devoting myself to private studies, for which I wished to keep myself free from other pursuits, and finding that he gained nothing by entreaties, he proceeded to utter the imprecation that God would curse my retirement and the tranquility of the studies which I sought, if I should withdraw and refuse to help, when the necessity was so urgent. By this imprecation, I was so terror—struck, that I gave up the journey I had undertaken; but sensible of my natural shyness and timidity, I would not tie myself to any particular office.